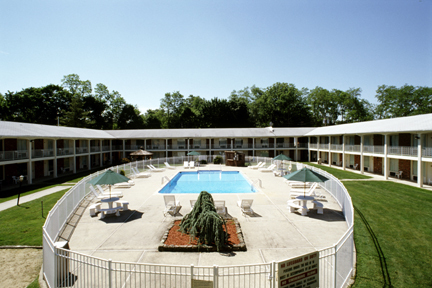 to the Crystal Inn at Eatontown, one of the finest motels in Monmouth County. Indulge in our 77 spacious and stylish rooms that each include free wireless internet, microwaves, refrigerators, and cable TV with HBO. Swim in our large swimming pool, lay out on the patio, or relax in one of our gazebos. We also provide complimentary breakfast in our lobby and coffee around the clock. The Crystal Inn is centrally located on Highway 35 (Main St.) right across the Fort Monmouth gate and only minutes from everywhere you want to be! The beautiful Jersey Shore and beach at Pier Village in Long Branch are only minutes away, and Monmouth Racetrack and Freehold Racetrack are both only a short drive away. See Attractions for more information. Shopping and nightlife abounds in our area. Explore the downtown Red Bank area as you visit the many retailers, have a great dinner, see a show at Count Basie Theatre or Two River Theatre, go dancing and enjoy drinks at the many nightclubs and lounges, and then come back and relax with us! We are also only minutes from the Red Bank Business district, Monmouth Mall, Monmouth University, PNC Bank Arts Center, Red Bank Antique Center, Fort Monmouth and Six Flags Great Adventure. Let us know if there is anything we can do to make your stay special. Come stay with us and see why We are the Most Accommodating!